Der 59-Patton ist ein chinesischer premium mittlerer Panzer der Stufe 8. Nach 1960 begann die chinesische Regierung mit der Entwicklung eines neuen Panzers. Die Experimente der Ingenieure umfassten viele Ableger des vorher gebauten Typ 59. Ein Fahrzeug wurde mit Turm, Geschütz und Feuerleitanlage des amerikanischen Panzers M48A3 ausgestattet. 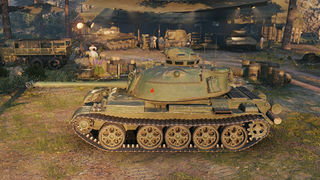 This tank was available in the premium shop on EU server from 28.September to 30.September 2015.,(it was available on NA server earlier). It is basically the same as T95E2, except it had a different hull and different tech tree. Gun depression is an advantage, with a whopping -9 degrees, surpassing the Type 59! Best view range in its tier, able to spot by only peeking out the cupola even a bit. Rather poor Penetration (although decent), it will struggle in Tier 10 battles (like the T95E2, but better penetration). Bad signal range, mobility, and HP pool, gets severely outplayed and rather useless when bottom-tiered. Frontal hull is made out of ammo racks (right-sided), fuel tanks, and gunner's and driver's seat. If you already have the M48A1 Patton, you should know how to play in this tank. Or if you don't have the M48A1 Patton, this will be a good tank to learn how to play it in. You must use your excellent gun depression to your advantage. With gun depression, as the 59-Patton has, you can easily pose a serious threat on a hill. Along with excellent gun depression, you get very good accuracy on the move, which is better than Pershing's. If you are moving @ 30 km/h, you have a good chance of hitting the target, which is at 50-100M distance. The 59-Patton's biggest disadvantages are the huge cupola on the turret roof ( which is lightly armored and inherited from the M48 ) and poor penetration. In Tier 8 battles there will be no problems in penetrating, only the IS-3 will be hard to penetrate frontally. In Tier 9 battles, you will be able to penetrate some of the Tier 9 mediums frontally, but there are no chances of penetrating any Tier 9 heavy tank frontally with AP shells ( except AMX 50 120 ) and there are some chances with APCR shells. The huge cupola on the roof of the turret is a very big problem ( many players say ), but that problem can be reduced if you move constantly, or if you hide it properly. But only Tier 6,7 and some Tier 8 tanks will aim for it if they see the whole tank, because higher tiers can easily penetrate the 59-Patton in every place of the tank they aim at. 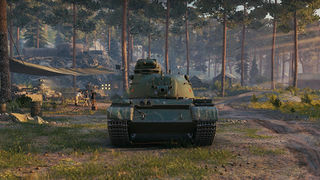 In Tier 8 battles you can bounce many shots if you angle your tank properly and if you hide the cupola well, despite the fact the turret is well-angled at all sides. In every aspect, 59-Patton is a very good support tank, so never, but NEVER go rush alone, because you will be destroyed easily if you encounter any Tier 8 heavy tank alone, and even some Tier 8 medium tanks ( like the T26E4 Super Pershing which is hard to penetrate ). Despite having a frontally-mounted ammo rack, one suggested equipment is a Wet Ammo Rack ( even with it you will have damaged ammo rack in 1/5 battles ), so first skill for the Loader should be the Safe Storage Perk, which will decrease chances of getting ammo rack damage. But the most vulnerable of all modules in 59-Patton is the fuel tank, which will be damaged in 1/3 battles. The 59-Patton is a very good support tank if you use it properly. Gunner and Driver will often get killed frontally 1/4 battles if not used properly. In Tier 8, the 59-Patton has the best accuracy on the move. The speed is in the middle of all Tier 8 medium tanks at 50 km/h, and has good armor at front side of the turret: 176 mm and even bigger in some areas ( like gun mantle, which goes to 400 mm of effective armor ). It has good mass, which makes it effective in colliding with some lighter mass Tier 8 medium tanks ( like the AMX CDC and STA-2 ). The cannon acts much like STA-2's 90MM Rifled Gun. Those two have almost the same penetration and same damage with same reload time. The 59-Patton has middle range penetration with the HEAT shell ( 250 mm ) which is able to penetrate all Tier 9 mediums and almost all Tier 9 heavies ( only VK 45.02 B, Type 4 Heavy and E-75 will be a problem ), and all Tier 9 TDs. 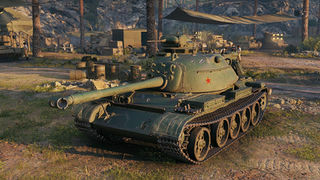 Again you will need assistance of some teammates if you go against even some Tier 8 tanks, and especially Tier 9 and Tier 10 tanks, because rushing alone on some full HP Tier 8 heavies and higher Tier tanks ( any type of a tank ) will be a horrible mistake, and will result in the destruction of your tank. Hills will be to your advantage, thanks to your gun depression ( -9° on side, -7° on front), but may be a disadvantage if you are climbing a hill and the enemy is already on the hill ( especially on Malinovka, which has a hill often full of enemy heavy tanks ). Enemies will spot the cupola first if you are climbing the hill. In those situations, it's best to wait for more armored teammates, who will absorb damage and allow you to be able to aim at the enemy without getting damage. So, the help of your teammates is needed if you want to play this tank effectively. No historical records of this tank exists. The Type 59's turret ring is too small to fit the M48 Patton turret. Diese Seite wurde zuletzt am 25. Oktober 2016 um 14:10 Uhr geändert.